Spigen designed heavy duty smartphone cover for drastic protection. Best for those who want to use their expensive mobile phone roughly and toughly. 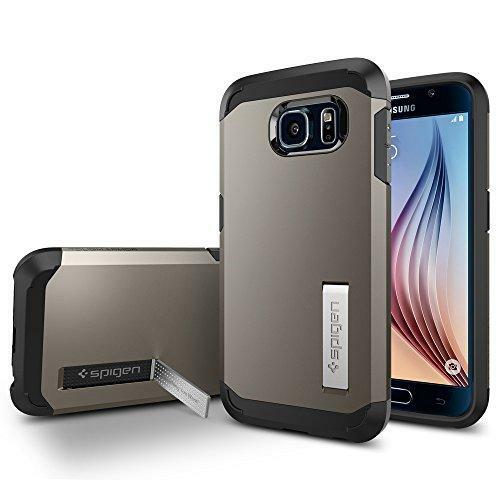 Perfectly covers your Samsung Galaxy S6 and keeps safe from all types of marks, scratches, fingerprints, bumps and drops. Online shopping this sophisticated shell from all cities of Pakistan. Beautifully designed case not only gives maximum protection but also enhances the value of your device. All ports and jacks easily accessible with protection case and due to its kickstand you get rest able position with better viewing.